I spent the morning yesterday (not an hour) figuring out how to transfer hundreds of photos from IPads and Androids to my laptop, so that I would have room to take more of them. I spent the afternoon sorting them into folders. Then I spent the evening trying to remember exactly where I was in Iceland when I saw this guy. I eventually managed it, as you can see from the caption, but it wasn't easy. For one thing, he doesn't appear on Google Maps. I wanted to make the process a bit easier for the next person, so I've submitted the location to Google. If that's accepted, I'll upload a photo and comment as well. The satellite imagery for this section of Iceland is not good. I had expected to make out the statue itself but could only see the pull-off where I parked the car to look at it. I hope I'm not more than a few meters off in my location. The Kleifabúi cairn was built in 1947 with left-over materials by the road-workers who made the route over the Kleifaheiði Pass. It is said to resemble Hákon J. Kristófersson, a farmer and congress man from the farm Hagi. I can't help wondering why. From many angles, it is possible to form a certain impression of this artwork, based on its fascinating profile. However, if you approach from the front, you can see that Mr Kristófersson is actually wearing quite a modest mid-thigh-length tunic. The protruding object he is clutching in his right hand is supposed to represent his sword. I took this photo at the Blue Lagoon, back in 2004. It looks really vintage now! For some years, the least expensive way to get from the East Coast of the US to London has involved a stop-over in Iceland. If you get your flights timed right, you can use this stop-over as an excuse to go and hang out in the Blue Lagoon, the geothermal spa near Keflavik airport. We haven't done this in the past (the photo above is from an actual trip to Iceland) but I was aware that the option was on offer from Icelandair as late as last weekend, and that it coincided with the cheapest flight available. I wanted this option! The challenge was to persuade Mike to be decisive enough to let me book a flight. He still doesn't even know what day he wants to fly out on yet, so booking him a return flight is out of the question. Make sure Icelandair doesn't charge more for booking two single flights versus one return flight. Complain when I discovered that the prices had gone up since the weekend. Complain even more when I discovered that the long stop-over flights had vanished from Expedia for the days and departure airports we wanted. Check whether the flights were cheaper and better from other potentially accessible East Coast airports on adjacent days. Figure out that there was no good reason I couldn't have a long stop-over on any day I wanted. Figure out how to make the Icelandair site give me a long stop-over (book a multi-stop trip at no extra cost). Discover to my delight that a long stop-over with our first choice of airport and day is still pretty nearly the lowest price after all. Book a single flight for three people. Cringe when I see how much a single flight for three adults costs. Check the relative costs of a bus versus a rental car to the Blue Lagoon. Cringe at the cost of car rental from Keflavik, compared to almost anywhere else on the planet. Book a car anyway, because it's still less expensive than three return bus tickets to the Blue Lagoon, plus it will give us a little extra flexibility. Surprisingly enough, that didn't take much longer than an hour and it's a load off my mind. NOW THERE'S ONLY ONE THING I STILL HAVE TO DO: continually remind Mike to book his flight to the USA, until he actually does it!!! OH YEAH, AND THIS: Book Blue Lagoon tickets when they become available, probably in March. From Wikipedia: Nikko... shall I, or shan't I? Oh... I did. For a visitor to Japan, checking the benefits of a Japan Rail Pass should be practically a reflex reaction. A 7-day or 14-day Japan Rail Pass is perfect for a typical first visit to Japan in which the visitor zooms around on Shinkansens (bullet trains) between Tokyo, Kyoto, Nagasaki and Hiroshima. Currently, those passes are priced at £184 and £293 respectively. Well, it turns out there is a better option, practically tailor-made for a trip like ours. Japan Rail offers many less well-known regional passes. We'll be travelling around Tohoku prefecture with a few days at either end in Narita and Tokyo respectively. We have a few days of long-distance expensive train journeys, interspersed with days of cheap, slow local transport or car hire. The Tohoku regional pass costs £124. It allows just five days of train travel, but very importantly, it allows you to spread them out as you like over a 14-day period. And incidentally, it includes Tokyo. It may even include a car hire discount, but I haven't looked into this much as yet. It would pay for itself on our very first 'expensive' day of travel. For the 14-day pass to prove better value, we would need to spend an average of £20 a day on local transport. I already know that's not going to happen: so far our most expensive 'local transport' day comes in at £10. As it is, having five 'expensive' days to play with encouraged me to look at Nikko, a town of which the Japanese apparently say "Never say beautiful until you've seen Nikko". It's not technically in Tohoku, but it is on the Tohoku pass. 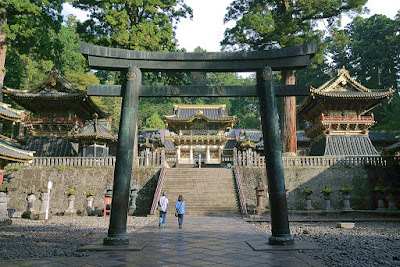 Somehow, Nikko really pulled my itinerary together, and by the end of the morning, I'd booked two night in a fancy ryokan in Nikko and two nights immediately before that near Sendai station (because we really want to visit Yamadera, and perhaps the coast, on opposite sides of Sendai). From Wikipedia: The Ocean, in the kind of weather you really get! 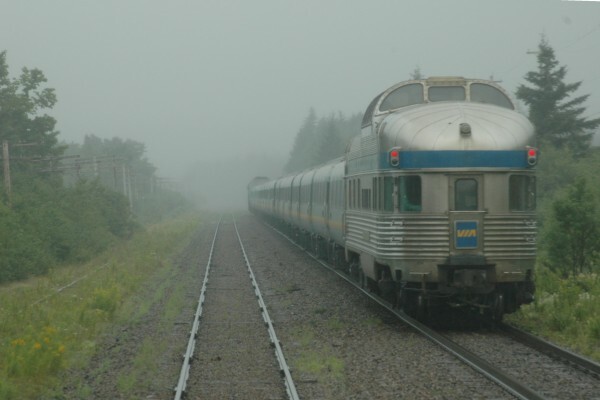 On Friday July 27 to Saturday July 28, we ride the Ocean overnight train from Montreal to Halifax. The train arrives at Quebec Sainte-Foy Station at 22.34 and leaves 15 minutes later. Sainte-Foy is a tiny place about 10km out of Quebec city centre. There's not much there and we'll be checking in just over an hour before departure so bring a book! We should expect to eat dinner in Quebec fairly early: a ViaRail shuttle bus departs Gare du Palais at 20.45, connecting Ocean passengers to Sainte-Foy. NOTE TO SELF: Book the shuttle tickets. If we leave our bags at the hotel for the day we need to allow a 10-15 minute walk to the station after picking them up. For the amount of luggage we have, we can either use the Ocean's system of checked luggage or carry everything on board. As we're likely to be in and out of our cabin, checking our luggage has advantages, but we will need to plan accordingly when we pack. We have a two-person cabin with a shower, washbasin and private toilet. It sounds very comfortable, but I have heard a few warnings about the excessively cooling nature of the AC, so bring warm clothing! At some point during the morning, our couchettes will be transformed into seats. Even so, we will certainly get better views from the Lounge Car and the Observation Car. During the night, the Ocean will hug the southern bank of the St Lawrence under a full moon as far as Mont-Joli, but despite the enticing names of the Quebecois towns, I don't expect to surface until after Matapedia, round about 6.30 am. By then, the train will have crossed the Gaspe Peninsula and started its journey along the Baie des Chaleurs. At around 9.30, it heads inland again, as far as Moncton. Prime viewing time is therefore between 7.00 and 9.30 am. Two meals in the restaurant car are included in the price our our ticket. Breakfast is first-come, first-served from 6.30am. I hear it is advisable to turn up early, before some items run out. A 3-course lunch is served from 11.30, and reservations will be taken beforehand. As we leave the train at Moncton at 13.23, we will want one of the earlier seatings. 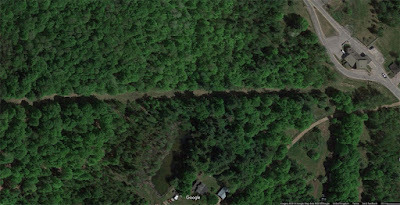 From Google: the 'trench in the trees' and a Canadian border post, about 20km west of the train crossing. (Updated: 7.34) 8.15 - the train goes up the Hudson River Valley, through Yonkers (8.44), Crouton-Harmon (9.03), Poughkeepsie (9.45), Rhinecliff (10.01), Hudson (10.21), Albany (10.47-11.10 - Rennselaer Station is small but very sweet), Shenectady (11.33), Saratoga Springs (12.02), Port Edwards Glen Falls (12.23). So many places I’ve heard of. It continues past the Adirondacks on the left and Lake Champlain on the right: Whitehall (12.47), Ticonderoga (13.20), Port Henry (13.42), Westport (14.02), Plattsburgh (15.20). So many places I’ve never heard of. Amtrak assumes that if you’re riding their trains instead of sweating through airports, you’re doing it in a spirit of decadence. Therefore, they publish a nice little guide brochure, telling you about the places you’re going through. Amtrak restaurant cars are pretty nice, but the Adirondack doesn't have one. I wouldn't count on the cafe car for anything other than weak coffee, weak beer and a packet of crisps potato chips. I already made a note to buy enough food for the trip. US immigration is at Rouses Point, Canadian immigration is at Cantic, round about 17.00? I think they do the immigration controls on the train and it looks as though it may take a while. As a US citizen, Mike just needs ID to enter Canada. For a while, I thought that as an EU citizen I needed a passport and an eTA. It turns out the eTA only applies if you’re entering Canada by air. Let's just hope there isn't a special clause for people entering by train and leaving by air. NOTE TO SELF: I still need to call Amtrak to confirm the ID we'll be using at the border. We really should have done this when we made the train reservation. We assumed we could enter it afterwards, as you can with plane reservations, but apparently not. While I was researching the immigration process, we learned this interesting tidbit about the USA-Canada border: instead of a wall, they maintain a trench in the trees! Along the whole border! We zoomed in on parts of this border with the satellite view in Google Maps. You can see the trench, and even some little neighborhood roads across the border which seem to be blocked with concrete bollards. We arrive at Montreal Gare Centrale at (updated: 19.01) 19.11, passing through Saint Lambert (18.57) on the other side of the St Lawrence River. It’s a 15 minute walk to the hostel, partly through Montreal's Underground City (if we can find our way). I've reserved a double room with a shared bathroom for two nights. Quite a few restaurants in Montreal close on Monday, and many others close by 22.00. I’ve noted some open and likely places close to the hostel in Google Maps. One or two have outdoor terraces. Also, I think Place d’Youville, on one side of our hostel, is pedestrianized in summer. Today, I turn my attention to those fiddly connection issues that go with train journeys. On Monday July 19, Mike and I take the train from Philadelphia to Montreal. Like this. 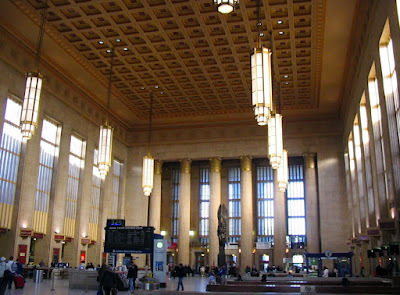 4.00 - A train departure from 30th Street Station, Philadelphia at 5.14 am means that we certainly need to be up by 4am. 4.30 - And we certainly need to be on the sidewalk outside the apartment by 4.30. Probably our best bet for getting to 30th Street is to walk three blocks (in the dark) to 19th street trolley station and ride two stops to 30th. At the very best this could take 15 minutes. NOTE TO SELF: make sure to get the tokens in advance. Also, print the E-ticket for this trip. 5.00 - 5am is the absolute last moment for arriving at a station you don't know and finding your platform by 5.14. Philadelphia’s 30th Street Station is beautiful, though I’m not sure we’ll be awake enough to fully appreciate it. I may drop by the day before to have a look around if I can. 5.14 - Philadelphia to New York Penn Station on the North East Regional Service, calling at Trenton (5.45) and Newark (6.22). NOTE TO SELF: buy breakfast and preferably lunch and snacks the day before. I’ve made a note on my packing list to bring a small cooler bag because we may often need to carry food around. The question is whether we should also bring a thermos for coffee/tea? Update on May 26th - we just called Amtrak because we thought we hadn't given them our passport details for the Canadian border crossing yet. Turns out we had, but in the process we learned that the Adirondack will now be leaving from Grand Central instead of Penn Station, about 40 minutes earlier than previously scheduled. Way to keep us updated, Amtrak! 6.40 - Get to Grand Central asap, bearing in mind that it's bound to take 30 minutes, however we do it. Find the platform. 7.34 - Depart Grand Central on the Adirondack. A visit to some of the more appalling circles of hell? New York’s Penn Station is well known to be a disgrace to civilization, a thing to which even the term ‘monstrosity’ is scarcely applicable, since it’s more of a tangled, ill-defined morass. It’s actually worse than Euston Station in London, and that takes some doing. I don’t put up with Euston Station. I camp out in the magnificence of St Pancras just up the road until it’s nearly time for my train to leave. I was tempted to do something similar in New York, using the beautiful Grand Central Station as my waiting room. The problem is that we only have 1 hour and 40 minutes to wait. Also, there is no checked baggage on this route, so we’ll be stuck with all our stuff. Assuming the train is even on time, it’s still doable, but not necessarily worth it. Besides, I had a lot of fun reading about the repulsiveness of Penn Station. It certainly inspires people to heights of eloquence, if nothing else. After a while, I actually felt motivated to view these horrors for myself. There is some hope that they will soon be consigned to history, and we really should do all we can to preserve the memory of them so that our descendants can see what not to do. Shouldn't we? But are we strong enough to endure the necessary torment? I'll decide later. People sometimes wonder if you're allowed to take photos on station platforms. This would suggest that ticketed passengers who are entitled to be on the platforms also have a right to take photographs there. Today, I'm figuring out mine and Antonia’s accommodation in Tokyo. Tokyo is a little overwhelming. Also, it looks like one of those Japanese spirits you see in anime. On one of its hungry days. Also, it has spots, although to be fair, I put them there. 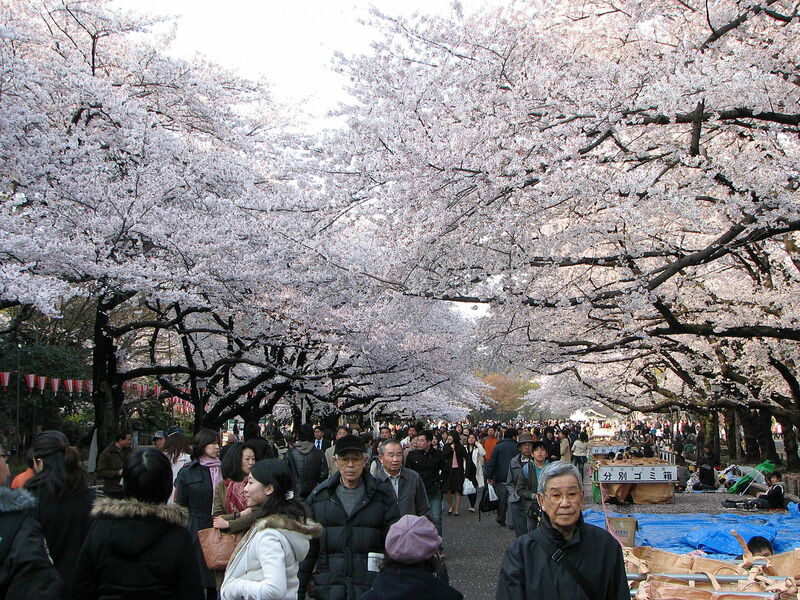 First, I need to decide whether we will stay in Tokyo on the last night or in Narita which is nearer the airport. The flight is at 10.40 which means we need to reach the airport by 8.40. The journey takes over an hour and this means we would have to be at Ueno Station in Tokyo by 7.15-ish, which might mean getting up around 6.00. Alternatively, if we take the train from Narita, the journey takes less than 20 minutes or there's the hotel's shuttle bus. That sounds like the more comfortable option, so Narita it is. I always end up in the same hotel in Narita, the U-City. It's absolutely fine, very good value for money and very, very convenient. We're álready staying there on our arrival in Japan. My next task is to figure out some Tokyo accommodation. In order to do that, I need to decide which day we'll arrive on. I thought I would do a quick check on accommodation prices in Tokyo before I make this momentous decision. Not surprisingly, there's a lot of choice. Surprisingly, it's not too expensive. I also realized that I would need to make a decision about which area I wanted to stay in. To do that, I need some kind of activity plan, so I took to the internet and read a few pages of the '40 Best Things To Do In Tokyo' variety. Armed with a shortlist of ones I liked the sound of, I started placing them on Google Maps. There's a cluster around Ueno Station, so I'll fine tune my searches around there. I still have to pick a number of days, but I’ll be doing that tomorrow because my planning hour is up.